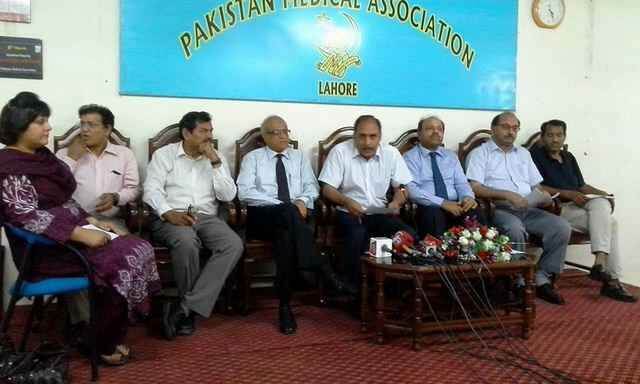 Lahore: PMA holds a press conference highlighting administrative & financial anarchy, anti doctor policies and irregularities in vougue at PMDC. Executive council of PMDC is working in conflict to Section 10 of PMDC ordinance (amended)2012. The current decisions of this executive council are unconstitutional and are threat to newly graduating doctors. The current recommendation of executive council reflects that universities will take examination on conclusion of house job and on the maximum two chances will be given to house officer to qualify examination, otherwise he shall repeat house job. Office bearers observed that house job completion is an assessment of professor and experience certificate of professor and of medical superintendent confirm the skills the house office has learnt and no university examination is needed for this assessment. The executive council is creating chaos, confusion and anarchy for young doctors in the name of this futile examination cycle. Office bearers also highlighted the chaos and confusion created by CME Model of PMDC, which is creating insult to injury for senior doctors. Office bearers observed that situation at PMDC is unacceptable and is condemned.